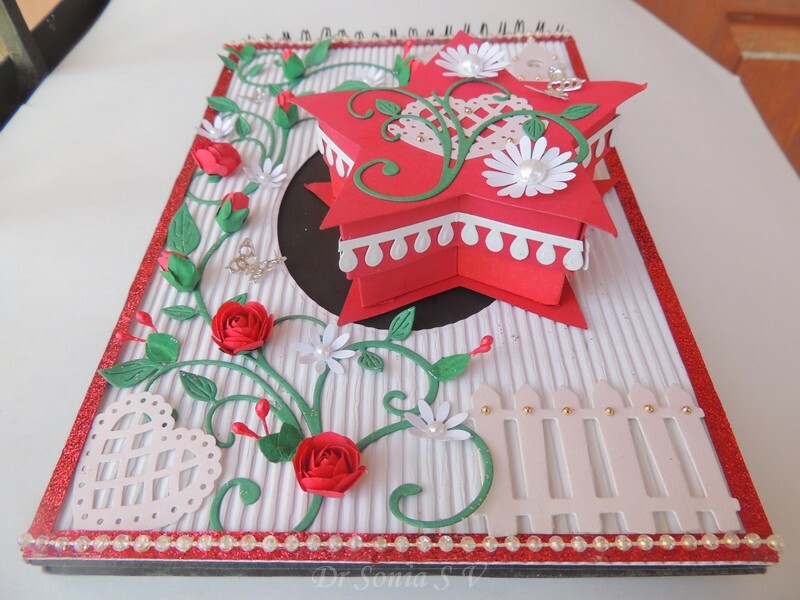 I had a ball incorporating pop up elements into this fancy fold card. 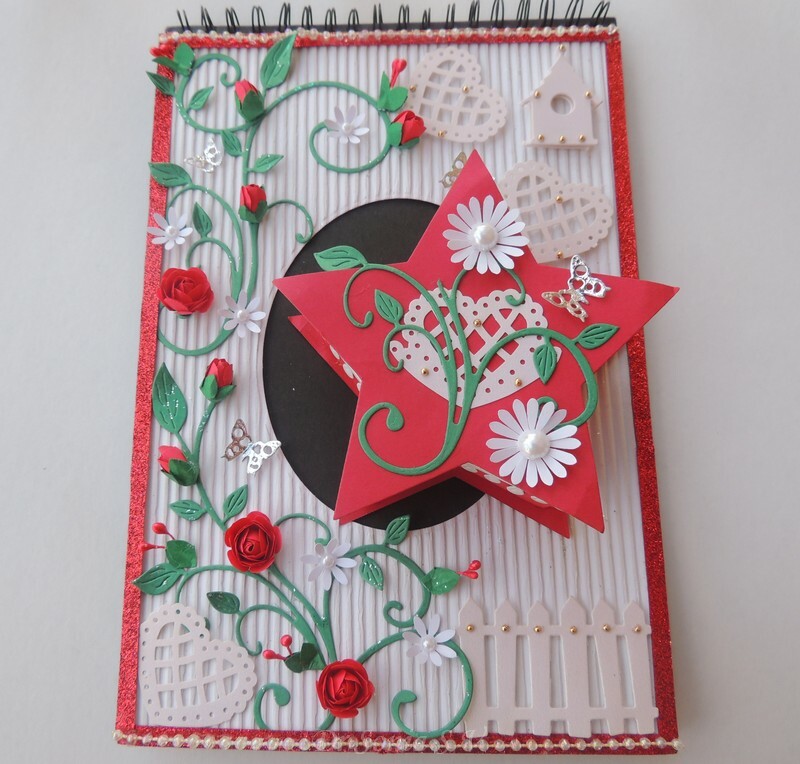 This is how the card looks closed.This card is inspired by my friend Merry's zig zag card.Hers has more folds,a belt and is much more elegant than my fancy fold pop up card. 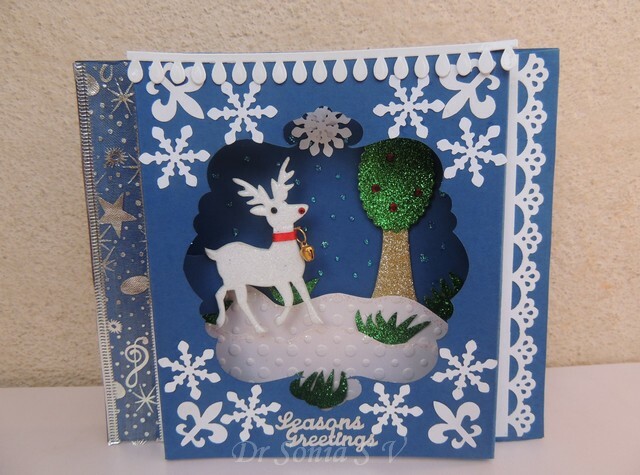 This is a super easy type of card to make and for those who make elegant cards..this has such a lot of potential. I unfortunately dont make good elegant cards perhaps because my assistant and critique is 6 years and almost all the cards we make are for her friends or teachers!! 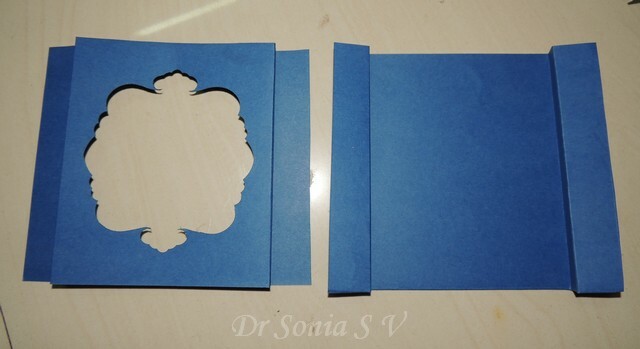 Choose a rectangular piece of card stock..mine is 6 x 12 inches. 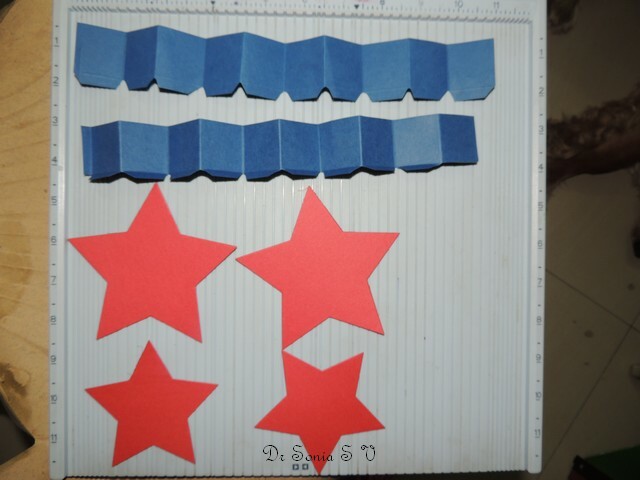 Any length you fancy will work...easier if its a multiple of 3 as you will have to divide it into 3 equal parts! 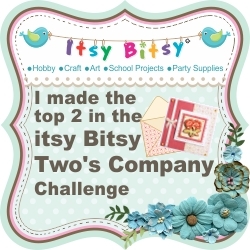 Since mine is 12 inches long...I first divided [scored] it into 4 inch segments. 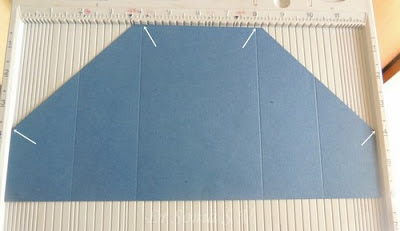 Then score a line to halve the outer 2 segments as shown above. Measure around 2- 2.25 inches above the lower border of the card at either end and join to the top of the 4 and 8 inch score lines as shown by the white arrows.Chop off the outer triangles as shown. Accordion fold as shown in the picture to make your Fancy Fold card ! 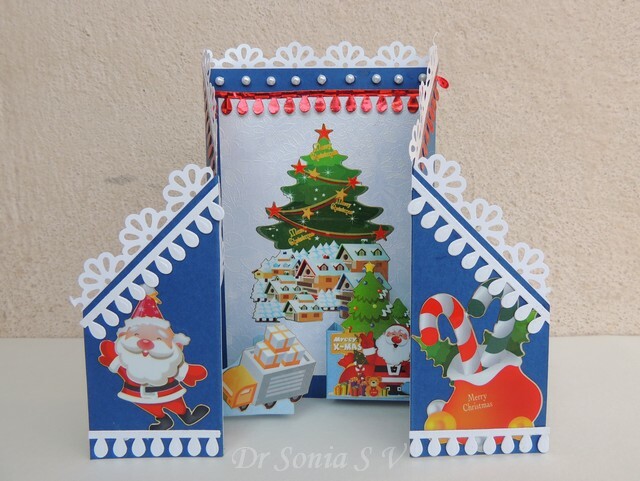 I added a Santa and a truck on each of the inner folds of the card to make a double pop up card. 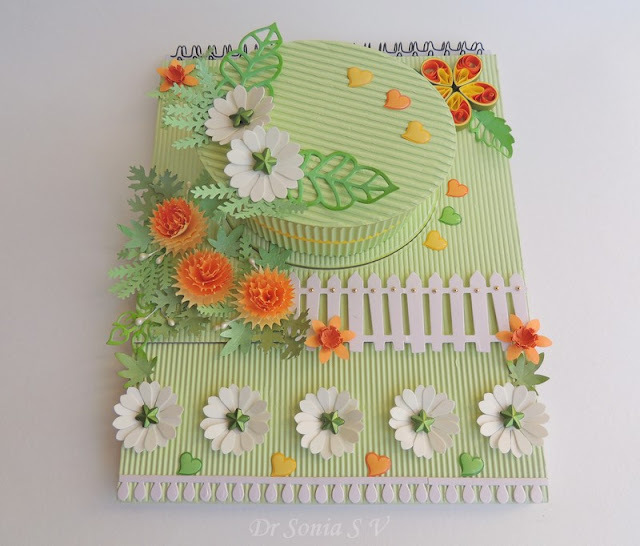 Blogger pals are the best and some such as Merry, Loz ,Helen and Hussena keep inspiring me again and again and I keep wishing to replicate everything they make! !.Thank you so much ladies! Also a special Thank you to all my blogger pals for dropping by and constantly encouraging me by leaving wonderful comments. 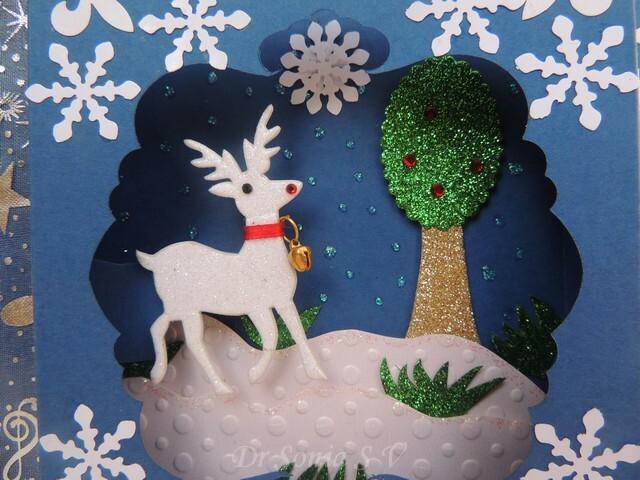 This year my 6 year old has 10 teachers and I am making special cards for each of them! I had lots of fun [and a bit of hair pulling moments !!] 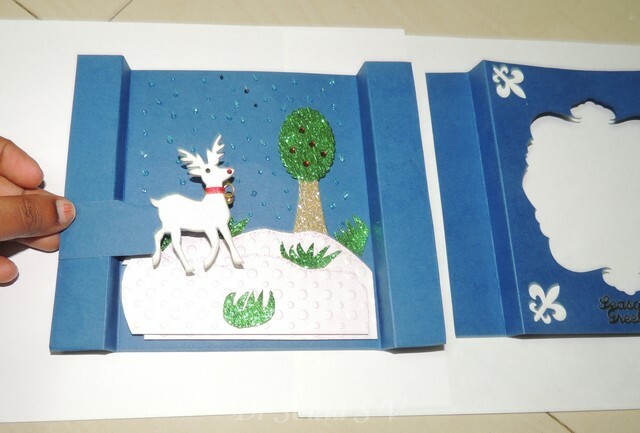 designing this pop up Christmas card. 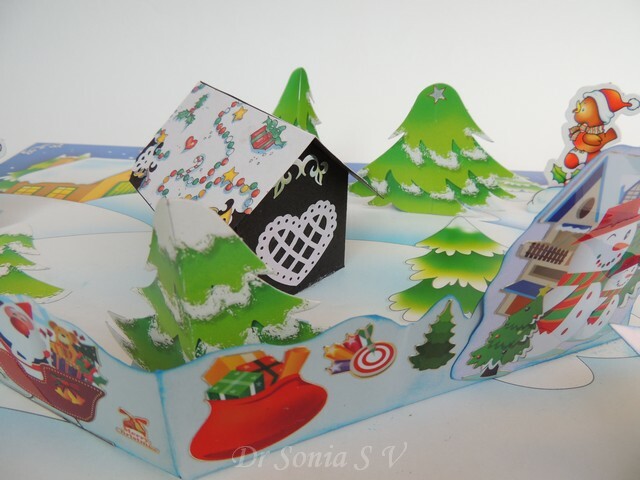 The Xmas trees behind and in front of the house are simple V fold pop up mechanisms.The reindeer sleigh and snowman also pop up by a V fold pop up mechanisms. 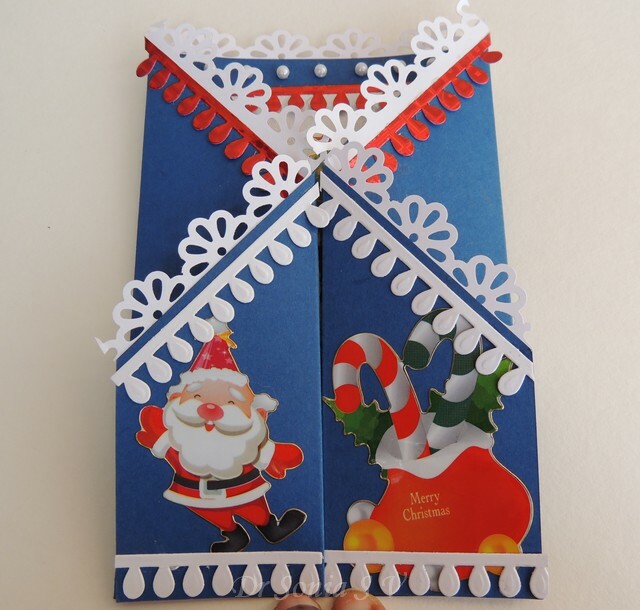 For pop up enthusiasts who face similar issues :Experiment with the position and angulation of the folded pop up element on the card before any gluing.Once happy...ie folded element is well within the closed card...glue the tab of one half and then apply glue on the other tab and fold the card over...this way you have a smarter V fold Pop up card! 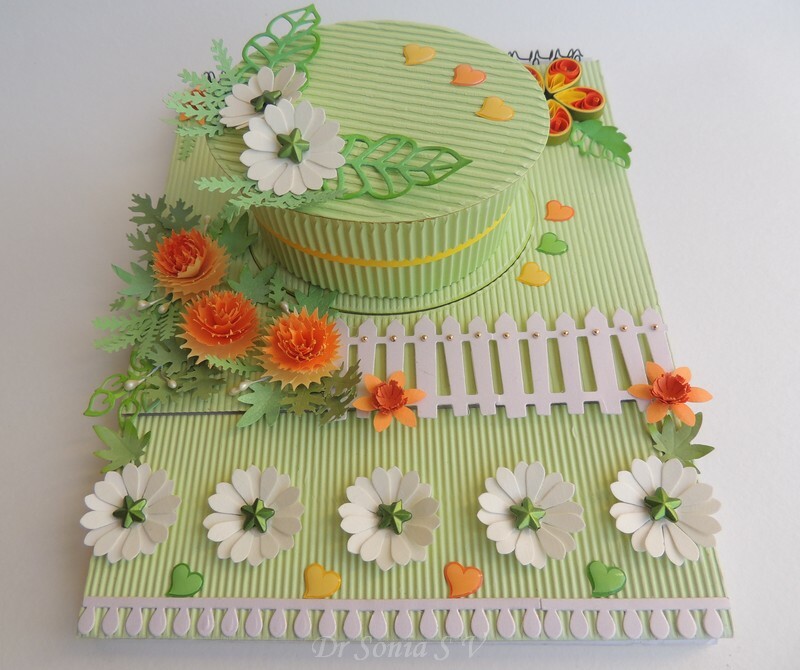 The spring pop up mechanism is super easy to make. 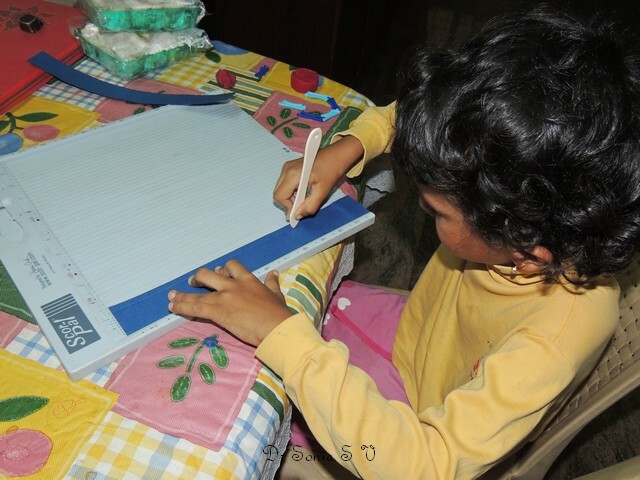 length of paper strip = depends of how much spring you want to give your pop up. Attach the folded spring as shown to your pop up element.Gluing position of the spring on the pop up element is important.I wanted just a gentle up ward pop for my star so glued the spring near the center of the star. 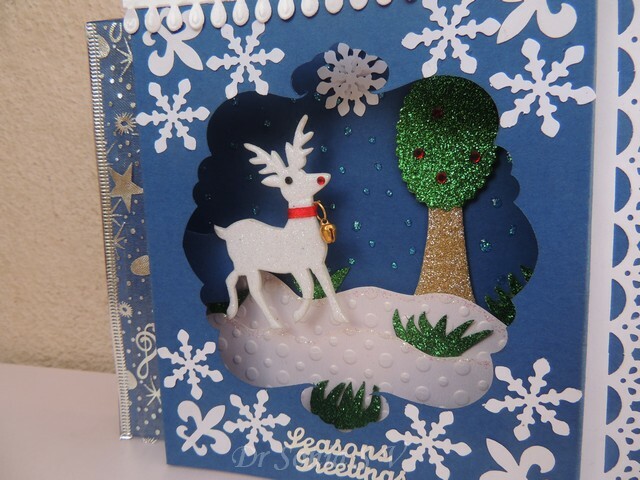 This is how the star springs up in the pop up Christmas card! 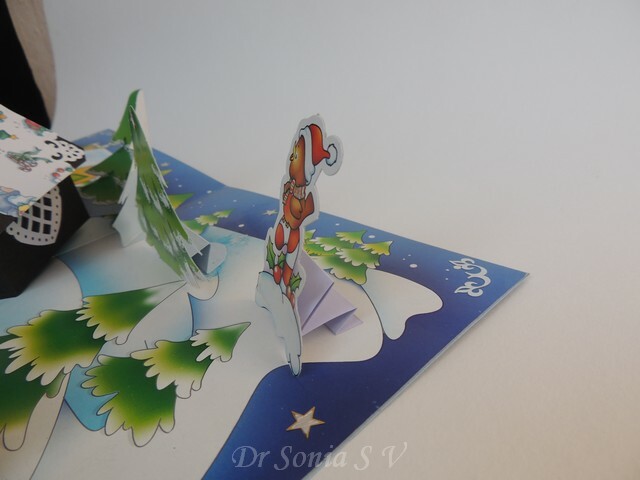 On the Robin I added more accordion folds and attached it towards the base of the Christmas robin so as to make it stand more upright on the pop up card. 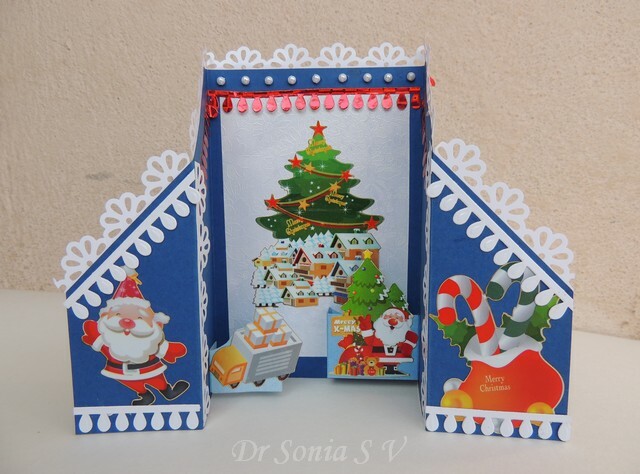 Since the V fold pop ups were so taxing I generously used the spring pop up mechanisms to make up my scenic Pop up Christmas card. 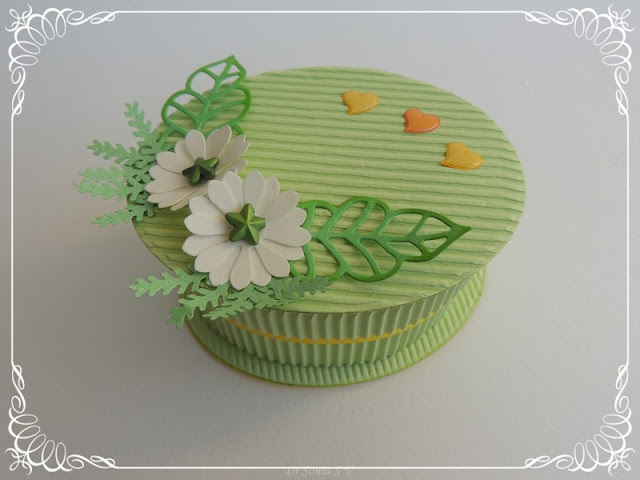 I know many people are daunted by the prospect of making pop up cards but I am sure you would have loved this spring pop up!Do tell me what you think! 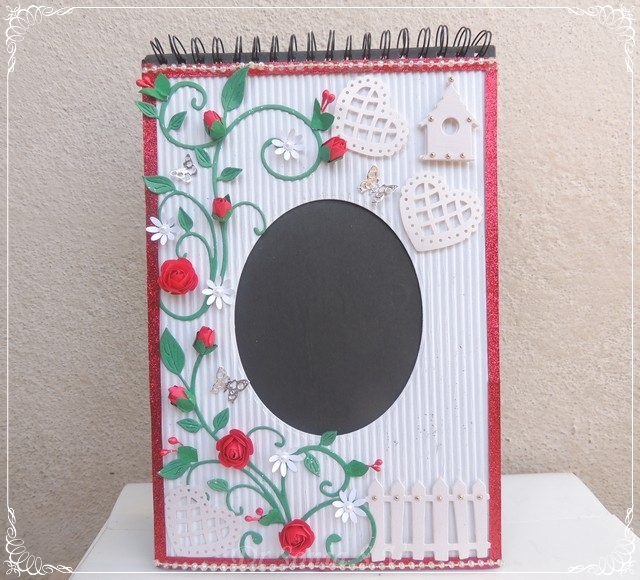 Edited:This project came Tops 3 at ICRC 24 and earned me a Guest DT post.Yippee! 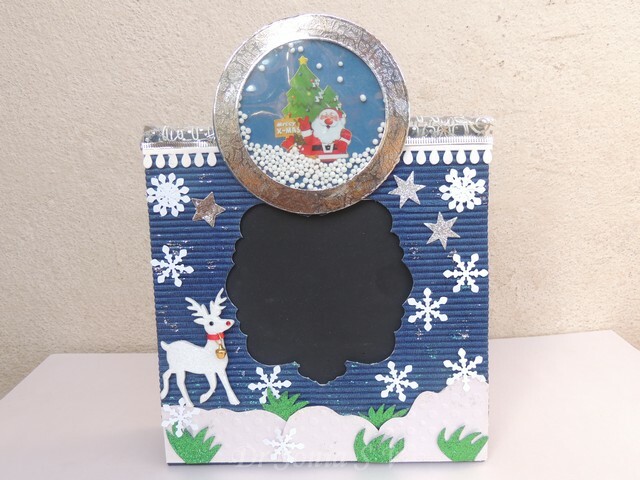 This is a gift set [for my daughter's teacher] of an Interactive Photoframe[has a shaker snow-globe] and an interactive window card. 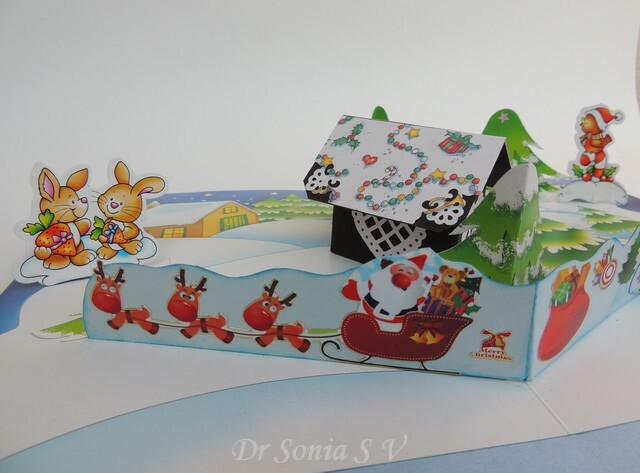 The little reindeer slides to and fro across the snowy scene on pulling and pushing the side wings of the interactive card. 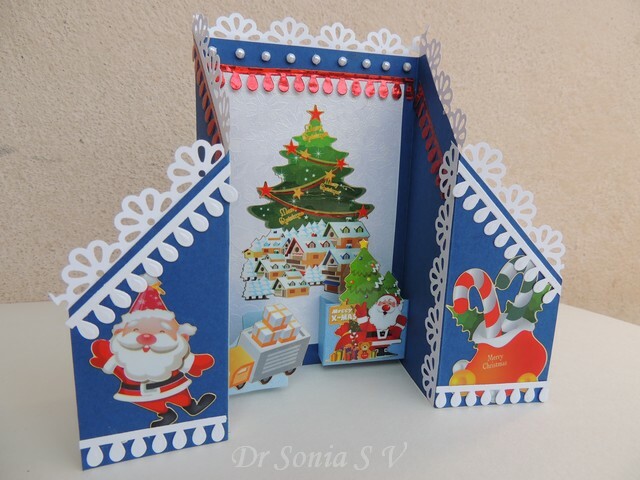 This is a super fun and easy card to make. 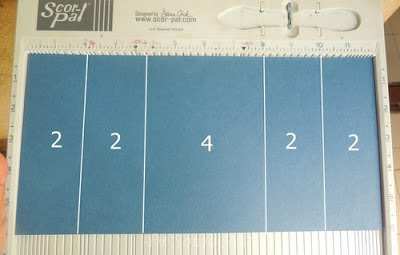 Something to measure and score : You can use a scale and blunt used pen .I have used a scorpal. 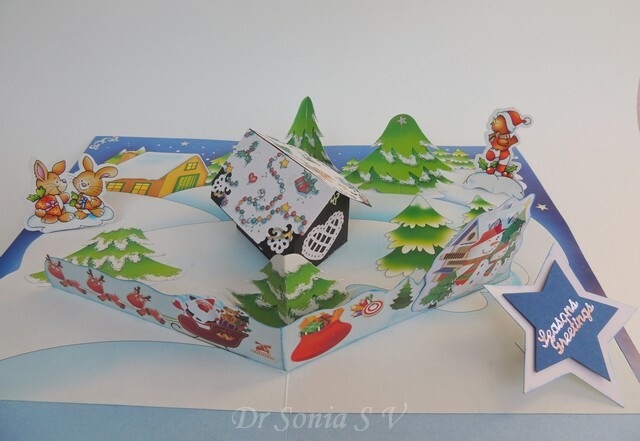 This is one card where you need to be accurate to get the fold right! To cut a window : Its perhaps easiest to use a Xacto knife to cut out an aperture .I used dies and a big shot[one is obliged to play with new toys!]. 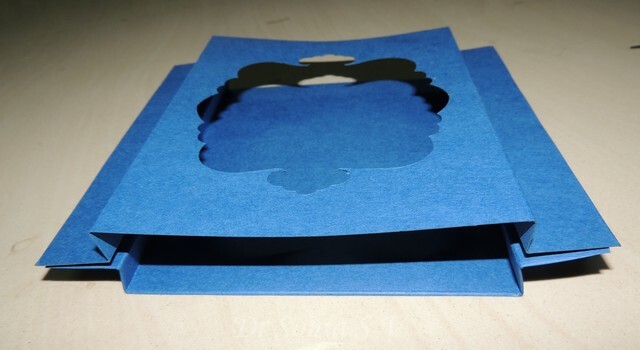 Good strong adhesive : I found white glue[Fevicol MR] the best as it doesnt dry too fast and you can play around with the position of your interactive elements and correctly position the 2 parts of your interactive card. Take 2 pieces of same size card stock [mine 8 x 6 inches].Score 2 ends at 1 inch from the edge and then at 1/2 inch from this score line you made as shown.For those with a scorpal this translates to score at 1, 1 1/2,6 1/2 and 7 inch.You can play around with your measurements according to your card dimensions and what depth you want to give the window card. 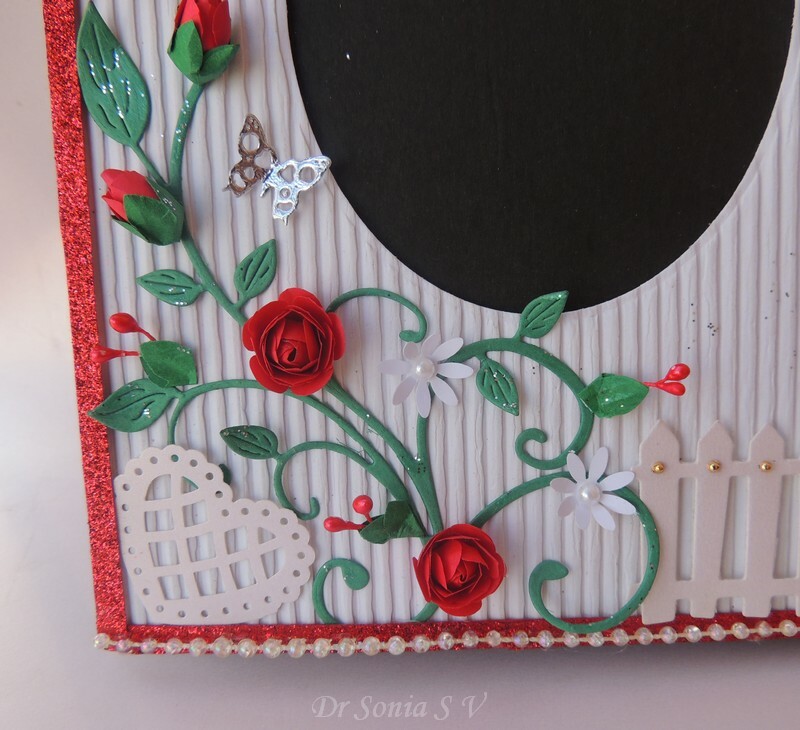 Cut out an aperture on one of the card pieces positioning your aperture well within the inner score lines of your window card. 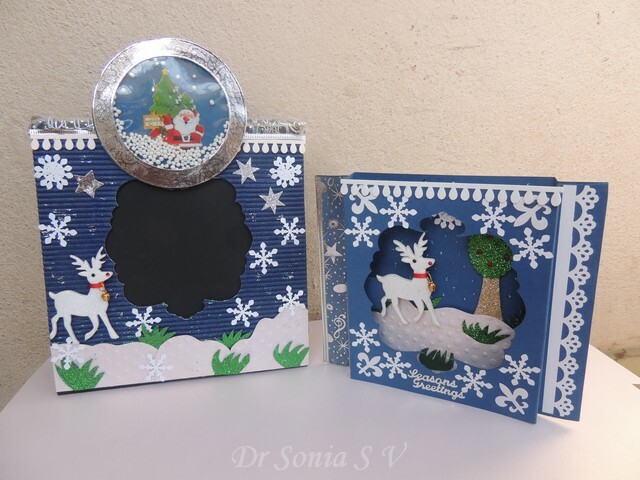 Experiment with the positioning of your interactive element and how it looks through the window of your interactive card. 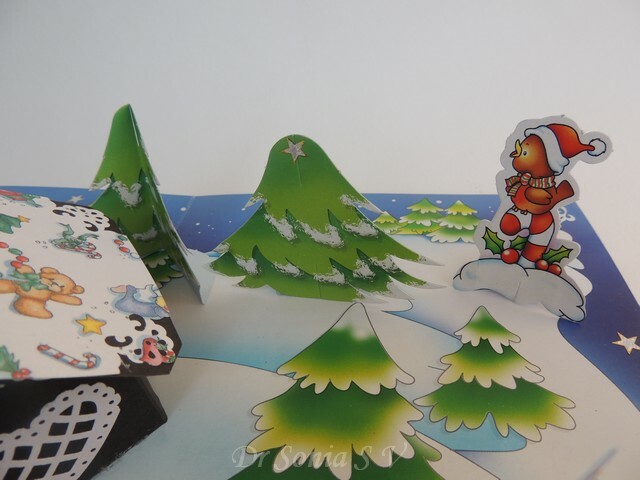 Once you are happy with the position ,apply glue on the outer edges[your 1 inch panels],stick on your interactive element and the window cut part of your interactive window card. 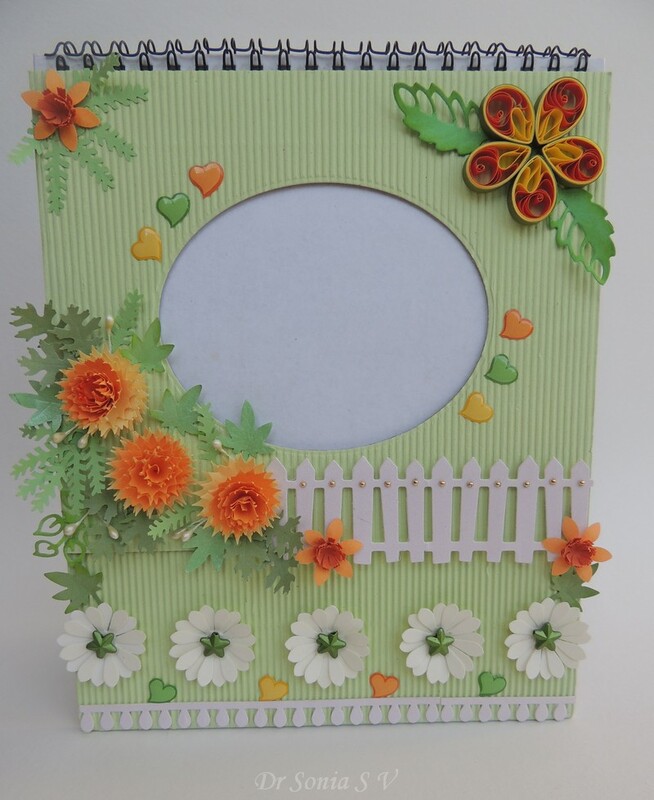 Dont add heavy embellishments on the top panel of your window card. Since I was gifting all the teachers photoframes this year, made a matching photoframe with a an interactive snow globe shaker. 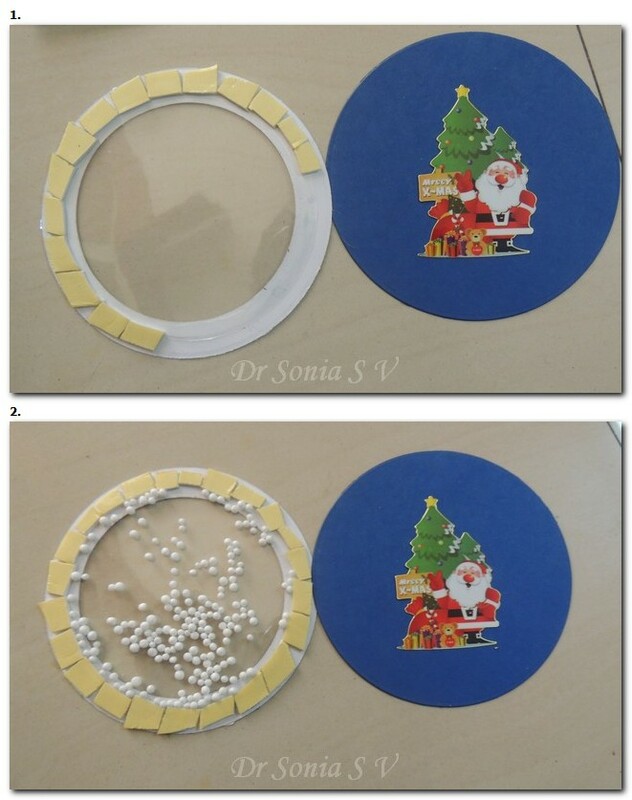 Cut 2 similar sized circles from card stock. Cut out an aperture from the center of one circle. 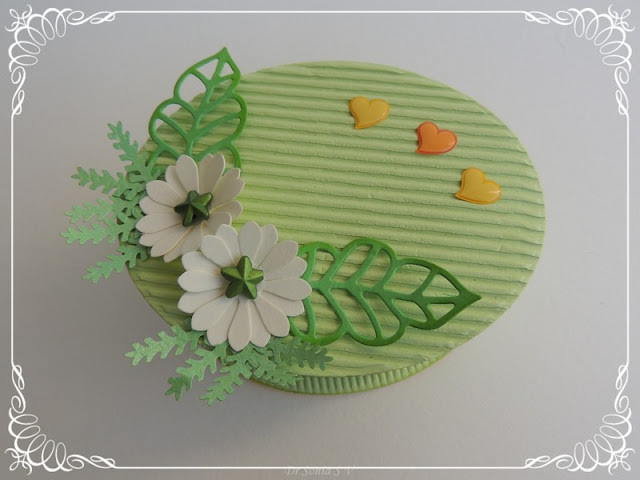 Cutting out circles is a bit tricky with the xacto knife so you may "cheat" and cut a square! 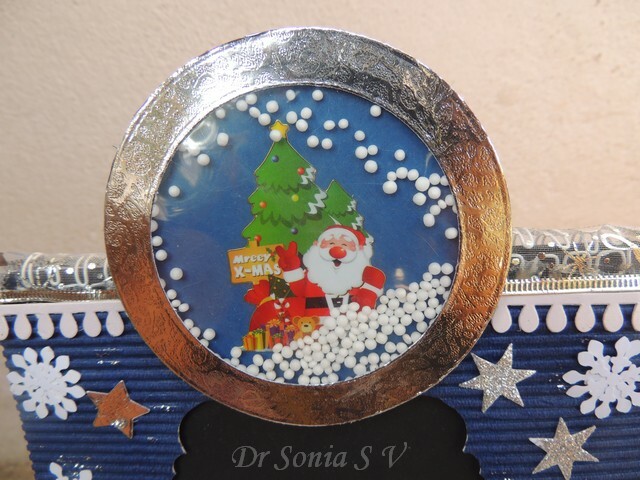 Making the snowglobe was so fun...I confess I will miss playing with it when we gift the snowglobe! 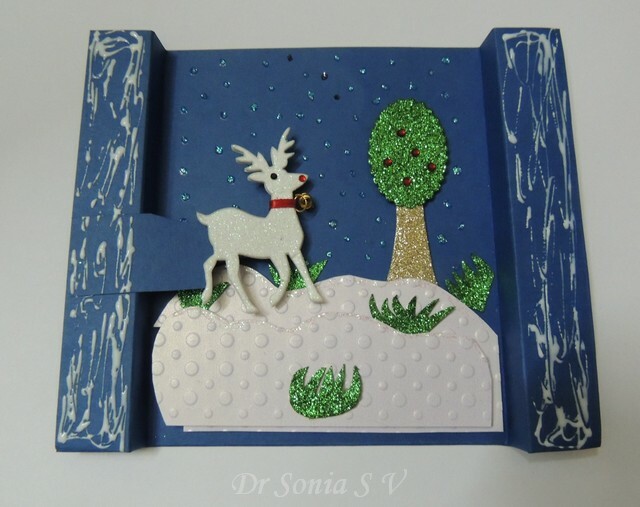 I dont know if this type of interactive card and frame will appeal to an adult but my daughter [just 6 yrs] likes it so much she wants to gift it to her favorite teacher! This handmade photoframe and gift box is yet one more addition to the series of Christmas gifts I am making this year for my daughter's teachers. 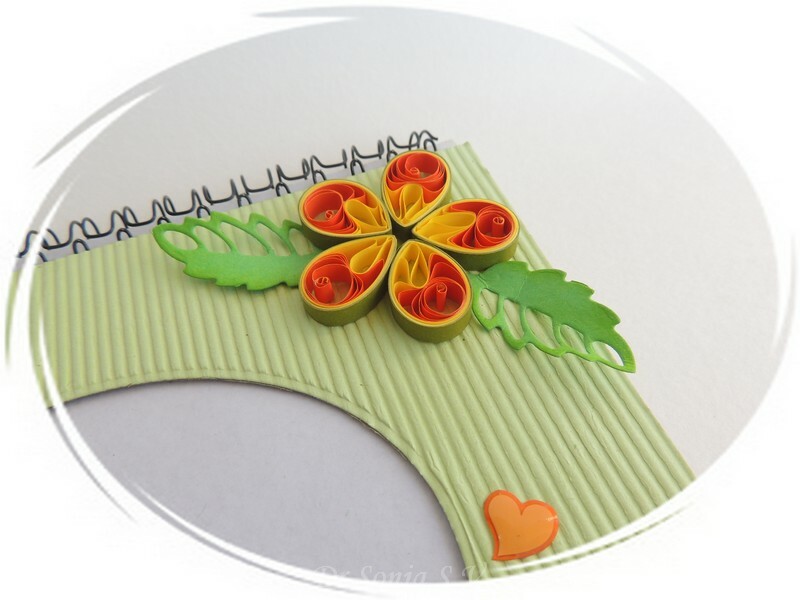 Here is the closeup of the quilled flower. 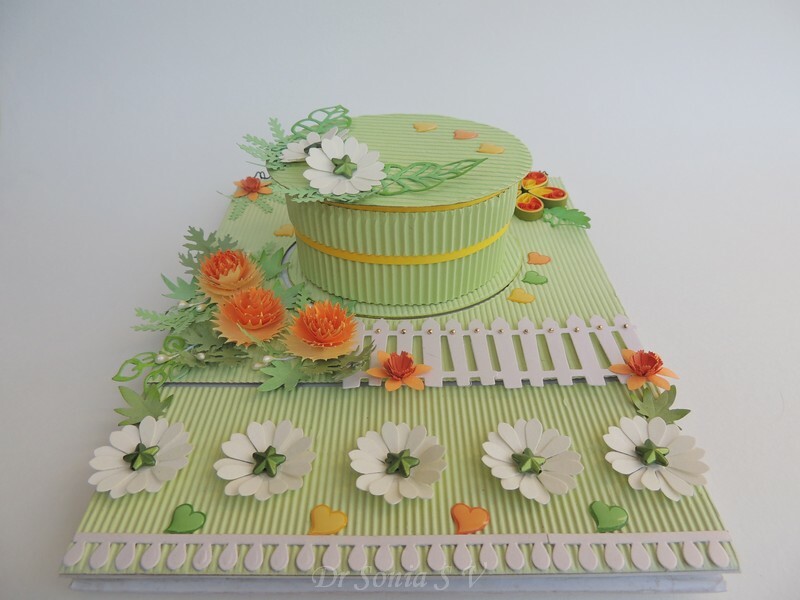 I dont usually make stuff in "orange" but somehow used all orange colored punchcraft flowers. 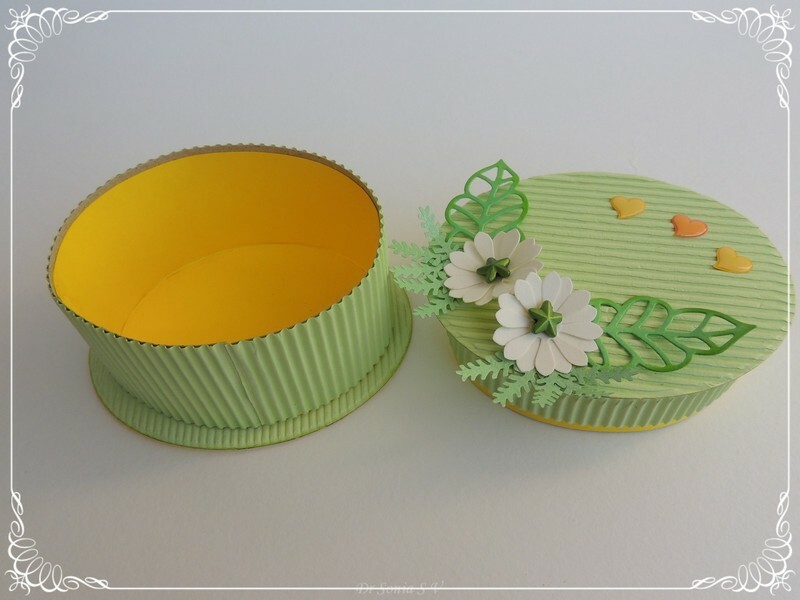 I didnt take photos while making it, but it was fairly simple to make the oval shaped box. 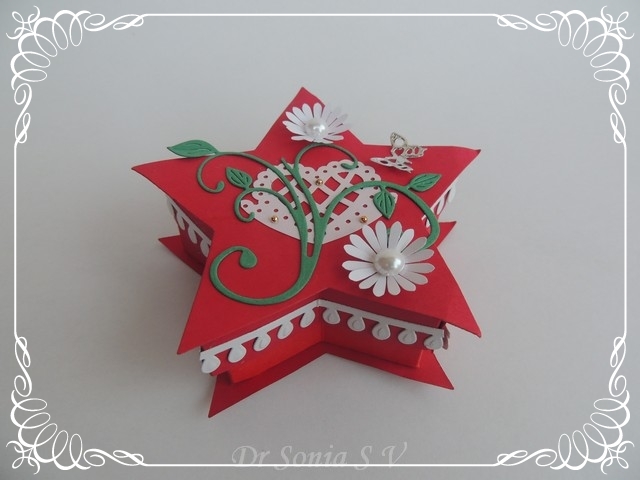 As a Christmas gift for my daughter's teacher we made a handmade recycled photoframe and matching star shaped gift box . The golden dots on the house ,fence and lacey hearts are bindis [fashion accessories! ].Wrapped half a punched flower on flower pollens to make the tiny flower buds. 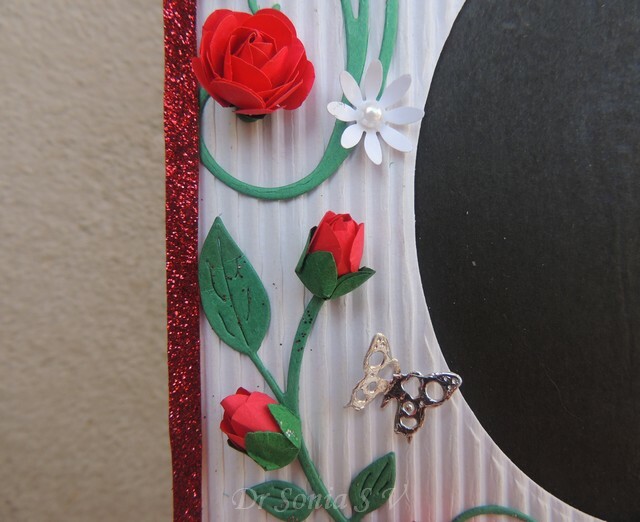 To jazz it up a bit in the festive spirit added glitter glue on the leaves and vines of the punchcraft roses. Making the mulberry type punchcraft roses used in these projects are a bit tricky and I didnt want to flood this blog post with the pictorial photos so made a slideshow tutorial .Please click on the little triangles to advance to the next slide of the punch craft rose and rosebud tutorials. 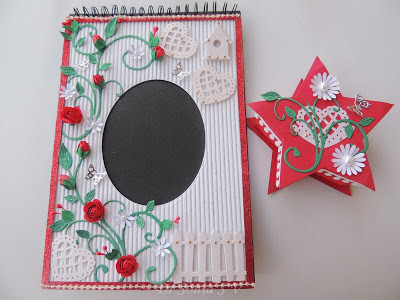 Paper: Paper chosen is of the utmost importance here.I found thin punch craft paper gave better results than cardstock as you need a bit of malleability.Some punchcraft paper does not stick easily...such papers will be a nightmare to work with ..experiment. 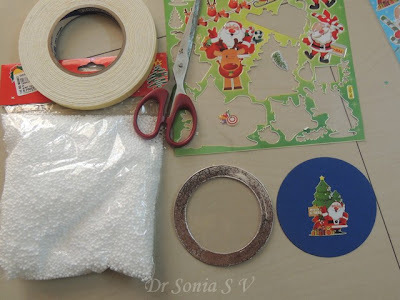 Glue: I used Fevicol MR.
Dont use runny glue...it should be a bit thick...if your glue is fresh and runny...put a big blob on a plastic/other surface and let it thicken for some time before you use it. Glue gun will scorch your hands[I tried ..so beware of shortcuts in this particualr punchraft rose!]. Your glue should not be very fast drying as you need a bit of time to mould and arrange the petals. Use the bare minimum of glue or your bud will be a squishy ball! 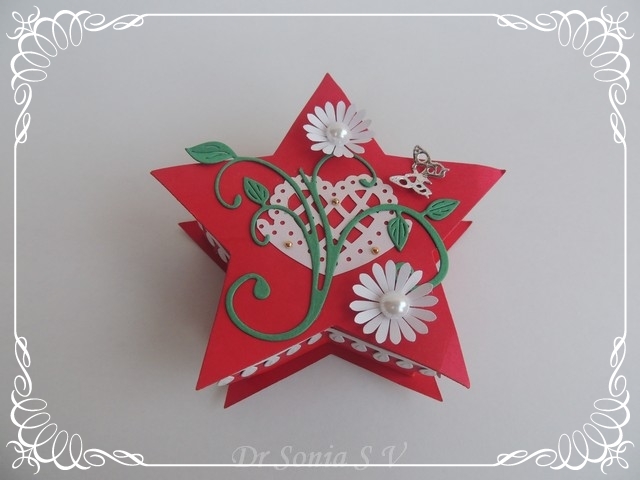 Added the same flourish vine ,MS lacey heart and silver die cut butterfly on the lid of the star shaped box. 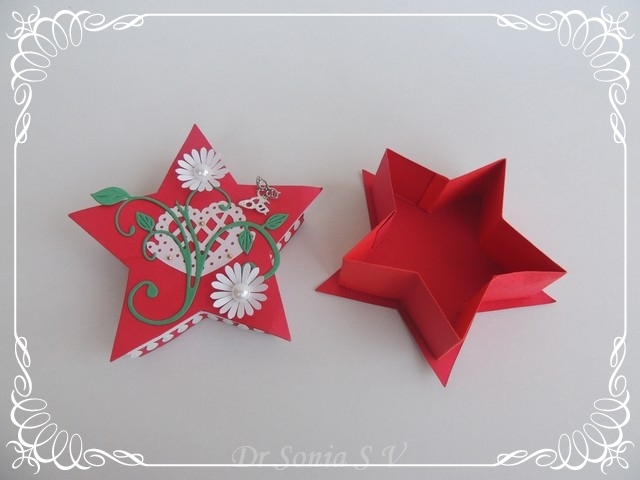 The star shaped box is easy to make and needs 2- 4 stars [handcut or die cut]and 2 strips of card stock accordion folded.